Unless you already noticed – we’re in the middle of a paradigm shift. We, similar to many of our fellow (social or regular) entrepreneurs want to be innovative – we want to go where no one else has gone before. We realize that the challenges we stand before are huge, but instead of feeling paralyzed or overwhelmed we see that this is our chance to make a difference. For a business there’s no challenge or valuable innovation in doing less bad. But doing good all the way opens up a whole new set of emerging possibilities that will lead to a progressive, innovative, and profitable business that integrates social and environmental values in the core. The role of business is moving away from profit maximization that benefits a few people - shareholders - to assuming responsibility and collaborating with others for the greater good of the community, focusing on the stakeholders. This paradigm change is good stuff. We’re moving from maximizing profit to seeking profits where it’s reasonable within the earth’s boundaries and also seeking to enhance other values such as environmental protection, equality, youth employment, and eradicating poverty. Just to name a few examplary goodies. What does this change look like in practice? How can we actually stay within the earth’s boundaries? Here are examples of businesses that lead this change by implementing courageous new business models. Moving from CSR to doing good as core business CSR (Corporate Social Responsibility) is often something companies do when there’s time and money left. However, what Ben Cohen and Jerry Greenfield, founders of Ben & Jerry’s (one of the largest ice cream businesses in the world), and other progressive companies are doing is to drop CSR and integrate social and environmental responsibility in their core business – for real. The social and environmental cause becomes inseparable from the business idea and business model. Businesses like Ben & Jerry’s are doing this by asking critical questions as they develop their business models and brands: What change do we want to contribute to? What vision do we have of the world, and how can our business work towards that? What challenges do our surrounding communities face? How can we adapt our business model to improve the lives of more people (co-workers, people living in the surrounding area etc.) and work towards a greener planet? A zero waste society – towards a circular economy The economy today is built on the assumption that we live on a planet with infinite resources. We take, make and waste without considering what will happen with the products after we are finished using them, so-called linear production. One of the most groundbreaking solutions to this is circular economy; the society and the economy are based on closed loop systems. In order to transform towards a circular economy it is required that business, government, and civil society work together to close the loop. A significant question of circular economy is how to keep products in the lifecycle forever. Either through qualities that make the product recyclable into infinity, or that the product can turn into compost at the end of its life. One example of this kind of design process is Cradle to Cradle, developed by the chemist Michael Braungart and designer William McDonough. 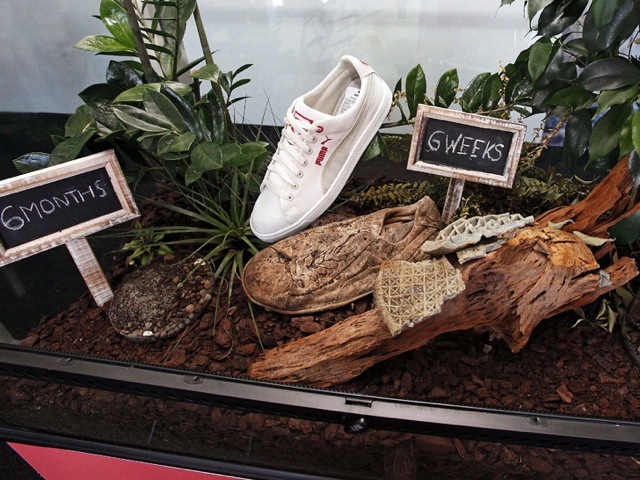 Companies like Puma, Bonkeli, Matilda Wendelboe and others are starting to produce shoes and clothes that are Cradle to Cradle certified – either all-in or limited to certain product lines. Why do less bad, when you can do good all the way? Desso is a big carpet company in the Netherlands that decided to give their business model a total make-over. They went from being plain eco-friendly to doing good all the way (not just less bad!) in all parts of the business. Some examples: they develop Cradle to Cradle products using renewable energy and their carpets clean the air (!) through special design features. By making this leap, Desso went from keeping a steady income to skyrocketing profits. So what is the role of your business in this paradigm shift? Will you stay ahead or wait for others that are more courageous than you to take the lead? We say: The challenge is on!